All Insurance carriers have different formulas to constitute roof damage. Insurance Carriers also go about paying for roof damage differently. 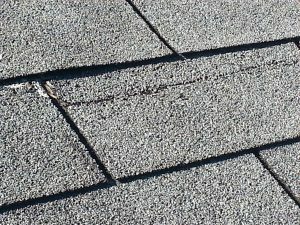 These different interpretations of the carriers responsibility can vary from replacing 10 individual shingles to replacing a single slope on your roof to entire roof replacement. The difference in the 3 can simply be the carrier and there interpretation of the covered damage. Its not likely or necessarily safe that you will be getting on your roof to assess the damage yourself, so having a qualified roofer may be a welcome party for all involved. Once you have decided that you have damage and are ready to file a claim, make sure you call your agent and let Him/Her know that you are filing a claim. 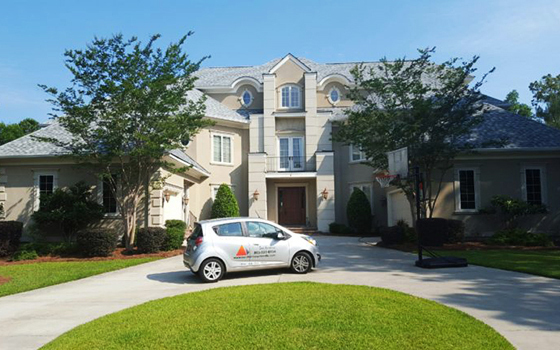 Have a local roofer inspect your roof and be sure that they are willing to meet your insurance adjuster onsite to go over the findings. A good insurance agent can be a strong advocate, coupled with a knowledgeable roofer you are set to make your case with your insurance carrier. In my personal experience an experienced qualified local roofer is a welcome source of knowledge during an insurance adjusters inspection. Your local agent should have experience with the carrier you have and will be able to offer some past experiences and possibly some tips to help you make the process as smooth as possible. 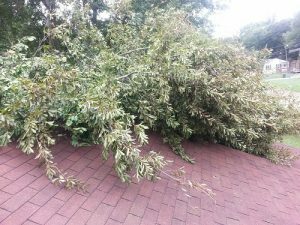 Storm damage can happen during any weather event no matter how big or small. Storm Damage ranges from Hail hitting your roof to a tree falling on your home from wind and everything in between. The most common storm damage to a roof in Lexington SC is wind and hail. Hail stones (even small ones) can hit your roof with the force of a red rider bb gun. 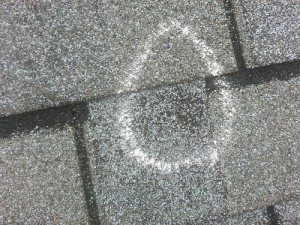 When a hail stone impacts an asphalt shingle roof several things can happen. 1. the granules can be knocked loose at the impact area causing a divot, this can be minor in the days following the impact but over time can cause the shingle to wear more rapidly than it would normally. 2. If the impact is significant enough the actual fiberglass matte in the shingle can be damaged causing a potential leak. 3. In the most extreme cases the hail stone can actually penetrate the roof decking and enter the attic space. You would only expect this type of damage with hail in excess of 2″ in diameter. Wind damage is also very common, especially on older roofs with 3 tab shingles. As shingles age they become increasingly more brittle and susceptible to being damaged by wind. Wind can cause trees to fall. At the end of the day your insurance carrier wants to take care of their responsibility to your claim and in my experience that is the main focus of 99% of all insurance adjusters. Taking the right steps during the claim process can be the difference in the adjuster being able to determine the extent of the damage and allowing for the correct coarse of action or not. Remember 1. Get your agent involved. 2. Have a qualified roofer do an inspection prior to filing a claim and make sure he is willing to meet your adjuster onsite to discuss his findings. Take these simple steps and your claim should go smoothly.